It is a cipher algorithm to convert electronic data or information to unusable format. It was written with the Genius, Hacker, Phreaker, Pirater, AI, Aliens and Almost-Average life form in mind. Its purpose is to create highly secure cryptographic system. It is an art, my dream to create an unbreakable cipher, the missing link to the future. Is it legal to use it? It depends on the law, were you are currently live in. 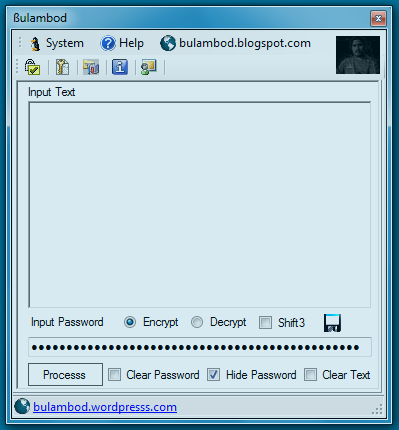 This program is FREE to promote Bulambod algorithm, but Bulambod algorithm is not FREE. Is it secure than other cipher algorithm? As long the information and password are unknown it’s impossible to crack or hack. This cipher algorithm cannot be used or embed in any software or hardware without approval of the author. This algorithm is secured that can produce unbreakable results. It can be design to used infinite password length, can use any number system known or unknown, can be design to use any kind of input device for password like laser, voice, DNA, video and etc.